Happy Solstice Everyone! My story is complete and time to enter into the woods as we await Solstice Day. ….Flickering light shone through the trees and the smell of fragrant wood burning wafted through the air…..
Lily walked slowly, the snow crunching under foot. She hoped not to frighten away the woodland creatures and did not want to make her presence known to whoever may be responsible for the lights ahead. 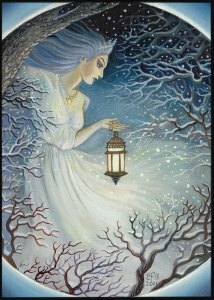 As she walked along the path that she knew would lead her to where she could see the light, she noticed that the flickering of light seemed to be pulsing in resonance to her breath. Excited by this thought, she began to breathe more rapidly, and with each inhalation and exhalation the light flickered matching its rhythm.